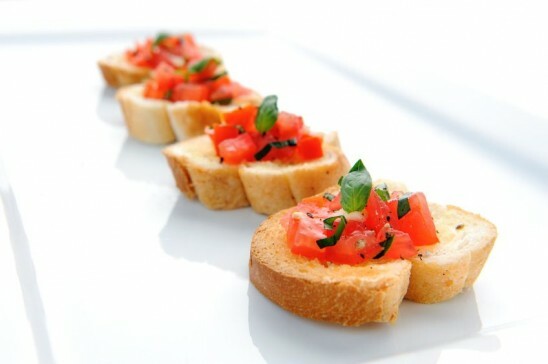 Bruschetta featuring assorted grilled and soft crostinis, served with a traditional tomato, basil, fresh garlic and olive oil topping. Use small heirloom tomatoes in assorted colors for a pretty presentation. Combine halved tomatoes, finely chopped onion, 3 tablespoons olive oil, chopped fresh basil, and balsamic vinegar in medium bowl; season tomato topping with salt and pepper. Preheat broiler. Place focaccia half, cut side up, on baking sheet; brush bread with olive oil. Toast bread in broiler until top is golden brown, watching closely to avoid burning, about 2 minutes. Immediately rub cut side of bread all over with halved garlic, then cut focaccia crosswise into 4 equal pieces. Make an hour in advance if possible. Top toasted focaccia with tomato mixture and serve.